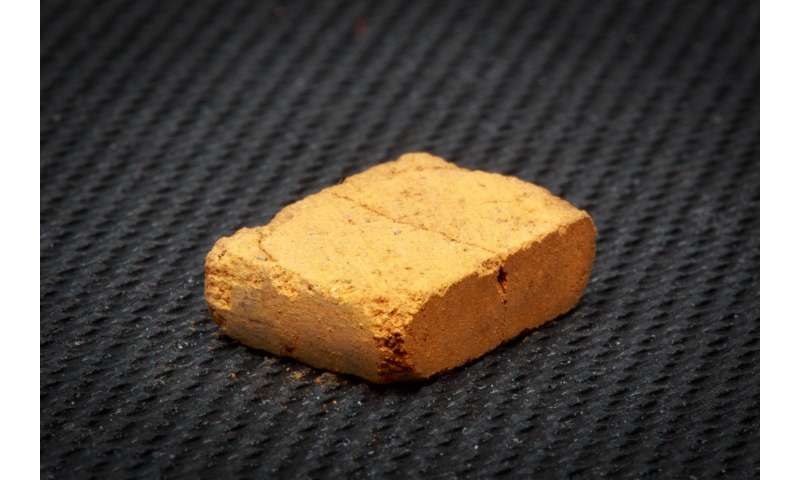 Explorers planning to settle on Mars might be able to turn the planet's red soil into bricks without needing to use an oven or additional ingredients. Instead, they would just need to apply pressure to compact the soil—the equivalent of a blow from a hammer. "The people who will go to Mars will be incredibly brave. They will be pioneers. 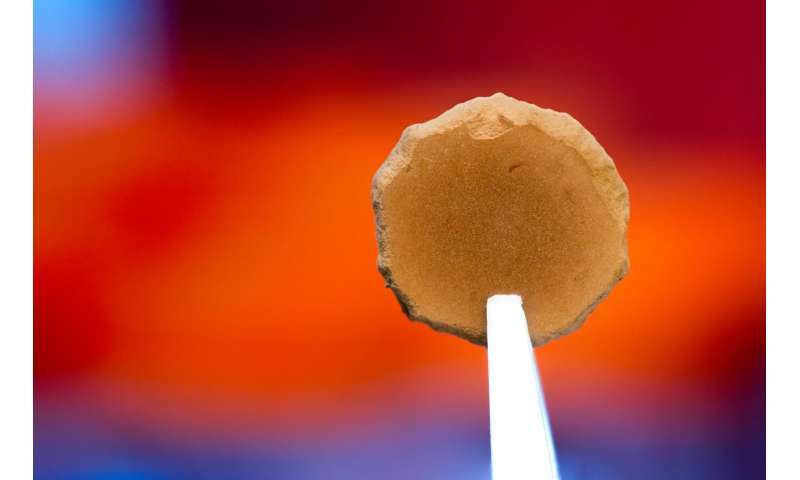 And I would be honored to be their brick maker," said Yu Qiao, a professor of structural engineering at UC San Diego and the study's lead author. The process produces small round soil pallets that are about an inch tall and can then be cut into brick shapes. 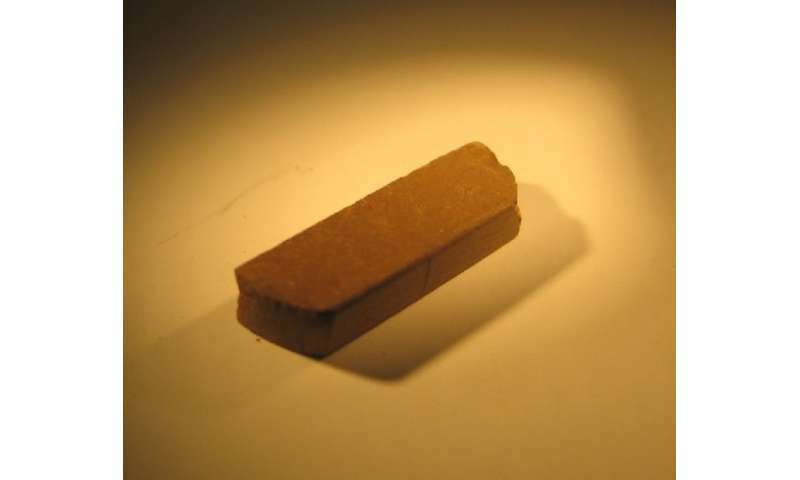 The engineers believe that the iron oxide, which gives Martian soil its signature reddish hue, acts as a binding agent. They investigated the simulant's structure with various scanning tools and found that the tiny iron particles coat the simulant's bigger rocky basalt particles. The iron particles have clean, flat facets that easily bind to one another under pressure. Researchers also investigated the bricks' strengths and found that even without rebar, they are stronger than steel-reinforced concrete. the equivalent of a blow from a hammer. Not too fast. Many don't appreciate, but a simple hammer blow can deliver ten tons of pressure. Not so little if you need to sustain it for more than the millisecond it takes for the hammer to bounce. If the landing craft could deliver the necessary blow to spank these bricks out of the Martian soil, making them wouldn't require an additional energy source (and the additional machinery to store/deliver it). Maybe the main craft orbits Mars a while as small machines land to prepare the soil for impact, then the main craft slams into the "brickyard". Which might also provide a shock absorber for a softer landing less destructive to the craft. Fair enough, but pressure is force per unit area. A small robot could apply ten tons of pressure to small areas for a long time. Send a few 3D printers on wheels to Mars ten years before the astronauts, and you could have a whole town built. "The engineers believe that the iron oxide, which gives Martian soil its signature reddish hue, acts as a binding agent. They investigated the simulant's structure with various scanning tools and found that the tiny iron particles coat the simulant's bigger rocky basalt particles. The iron particles have clean, flat facets that easily bind to one another under pressure." IRON particles? Surprisingly, this comes from the engineering school itself. On Mars, there is no free iron. This happens to be one of the earliest building techniques known as Rammed Earth. It has been widely used for centuries and is hardly new or their 'discovery'. There's no mention of atmosphere. In a vacuum some materials including metals can bond just from contact, to a greater extent than we see within the oxygen atmosphere of earth. Were these tests done in a simulated low pressure no-oxygen Martian atmosphere?